SABAH DIVERS, with our head office in Kota Kinabalu, Sabah, Malaysia, we operate one of the leading scuba diving education & training centres in South East Asia. 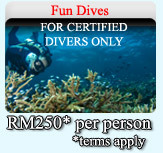 At SABAH DIVERS, we run a full-service dive shop and offer scuba diving courses as well as recreational dives. 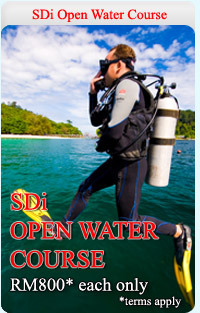 We have a whole team of qualified and enthusiastic staff instructors & divemasters to serve you. 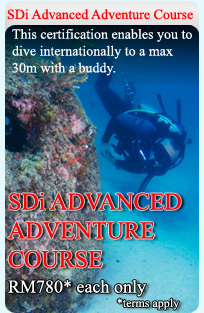 SABAH DIVERS can provide dive courses in English, Mandarin and Cantonese. 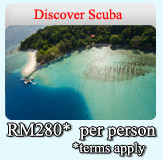 We also organize diving tours to popular dive destinations all over Borneo, such as Sipadan and Layang Layang. For friends & families of divers who do not dive, we can arrange for you land, river, mountain & aerial tours of destinations and resorts in Sabah, or simply a relaxing day on the beach. Sabah is well known for its nature, wildlife and adventure destinations. Thank you all for helping me to achieve a 22-year old ambition by becoming an Open Water Diver at the age of 63. I never really thought that I would be able to get through the course, but the tutors made it possible by their patience, consideration and care. The whole organisation was very professional, as you would expect when you are dealing with a potentially dangerous pursuit. There was never any chance the the Dive Masters were other than attentive and alert to every situation. Adam and Lily (from California) just wanted to say thank you for booking us the terrific package. The diving at Sipadan was indeed our favourite part about our visit to Borneo. So, from the bottom of our hearts: THANK YOU! THANK YOU! THANK YOU! Thanks for your hospitality when I was in Sabah a few days ago. Really enjoyed the tours that we book, it was worth it till the last cent. I will be sure to be back for more. We had a wonderful time learning diving skills and utilising diving gear for the first time. We would definitely recommend your services to our friends here in Melbourne, Australia and we're looking forward to going back for another diving experience in the near future. This is Marina and Andreas writing to you (remember, the honeymoon couple from Sweden, we did the Open Water with you about a week ago).